TORONTO, ONTARIO, November 26, 2017 – Thrilling pleasure meets intense driving performance in the 2018 Lexus RC series luxury coupe. And new for this model year, the RC 300 and RC 350 are both enhanced with Lexus Safety System + and Enform Audio. Curbside, the RC is aggressively sculpted – a design that boldly expresses its high-spirited performance. Deep contours reveal striking contrasts. The three-lamp LEDs at head and tail form a unique L-shaped pattern at low beam – a bold expression of Lexus identity. And up front, the L design flanks the lowest, widest, boldest application yet of Lexus's signature spindle grille. Other notable exterior details include heated exterior mirrors with integrated puddle lamps, a power moon roof, LED daytime running lights and clearance lamps, and more. Open the long coupe doors and the Lexus-first LED ambient illumination welcomes you – glowing floor-up rather than top-down, to convey the anticipation of your next drive. The front seats merge padding and upholstery to grip driver and front passenger in an optimized racing position, while the 60/40 split fold down rear seat provides ample room for two more, plus flexibility to haul cargo. The cockpit is streamlined and driver-focussed, with sport carbon fibre highlights set off against high-contrast NuLuxe trim. Other notable in-cabin features include dual zone automatic climate control, eco air conditioning, power adjustable and heated front row seats, a frameless rear view mirror, water repellent door glass, a heated steering wheel, the Smart Key System with Push Button Start, the signature Lexus analogue clock with LED illumination, and more. New for 2018, all RC models feature Lexus Enform, delivering thoughtful connectivity and peace of mind technology in one simple to use package. Enform App Suite 2.0 puts favourite apps at one’s fingertips, and lets drivers bring their music along for the ride. On the RC 300 AWD, Scout GPS-link cell-based navigation helps show the way, while the RC 350 AWD is fitted with Enform Destination Assist, including embedded traffic and weather. In the RC 300 AWD, this engine delivers 260 peak horsepower and up to 236 lb-ft of torque. 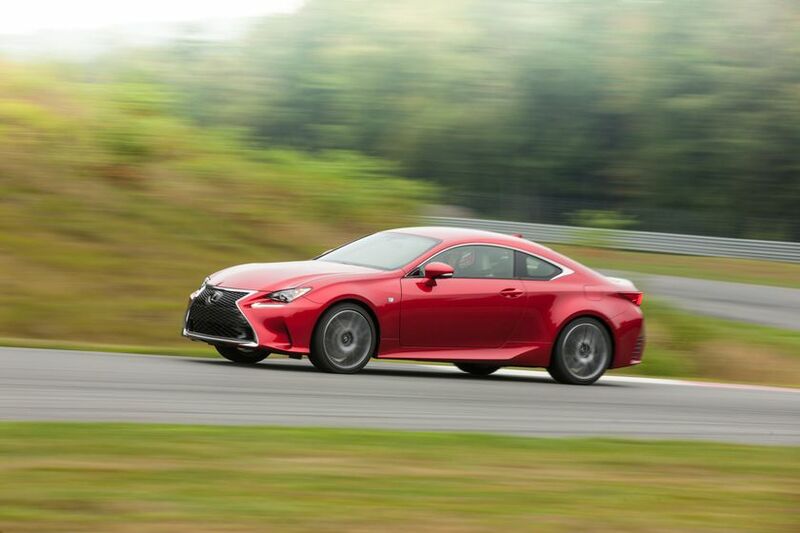 In the RC 350 AWD, this engine unleashes 311 peak horsepower and up to 280 lb-ft of torque. All RC models feature a six-speed automatic with sequential shift mode performance and steering wheel mounted paddle shifters, adapted from the IS F performance sedan to optimize power delivery and maximize fuel efficiency. The Lexus Drive Mode Select system lets drivers toggle between different driving styles – Normal, ECO, and Sport – to customize the experience based on mood and road conditions. Meantime, the all-wheel-drive system optimizes power to the front and rear axles for all-weather confidence. For the lover of high performance, the RC is a true platform. The chassis is expertly crafted to provide the rigid strength essential to high-spirited driving, while specially tuned front and rear suspension systems confer dynamic handling. Up front, the double-wishbone design offers a 20 percent increase in sway rigidity, while the rear suspension is built around a multi-link system tuned for high performance duty. Together, they provide outstanding grip and precise steering control. The RC series also features impressive safety performance. New for 2018, all models feature Enform Safety Connect including automatic collision notification, stolen vehicle locator, emergency assistance button and enhanced roadside assistance. Also new for 2018, all models feature Lexus Safety System +, including the pre-collision system with pedestrian detection, automatic high beam, dynamic radar cruise control, and lane departure alert with lane keep assist. Other safety features include Vehicle Dynamics Integrated Management, eight airbags, a backup camera, a direct tire pressure monitoring system, an onboard first aid kit, and more. The 2018 Lexus RC 300 AWD F SPORT Series 1 (starting MSRP: $57,650) adds several F SPORT specific features, including unique steering wheel, seats, seat material, and 19” wheels. Other features in this upgrade include active sound control, a driver’s seat memory system linked to a power tilting/telescoping steering column, a 10.3” display screen, Enform Destination Assist with embedded navigation, traffic and weather, Adaptive Variable Suspension systems for both front and rear, the Blind Spot Monitor and Rear Cross Traffic Alert safety systems, air conditioned front seats, an instrument cluster adapted from the Lexus LFA Supercar, automatic wipers, and more. The 2018 Lexus RC 350 AWD (starting MSRP: $63,050) is standard equipped with the F SPORT Series 2 package. This model features several F SPORT specific details, including front sport seats, shift knob, scuff plates, steering wheel, and 19” alloy wheels. Other features on this model include a 17-speaker Mark Levinson Premium Audio System, air conditioned front seats, a driver’s seat memory system linked to the power tilting/telescoping steering column, an instrument cluster adapted from the Lexus LFA Supercar, automatic wipers, intuitive parking assist, Adaptive Variable Suspension systems for both front and rear, the Blind Spot Monitor and Rear Cross Traffic Alert safety systems, premium LED headlamps, and more. The 2018 Lexus RC series is now on sale at Lexus Dealers across Canada. For complete and up to date details and specifications, visit http://www.lexus.ca/rc.